The Formula 1 2018 Honda Japanese Grand Prix kicks into high gear at the Suzuka Circuit in Mie from October 5 - 7. Don't miss it! The first Japanese Grand Prix was held in 1987, and 2018 marks the 30th Grand Prix event to be held at the Suzuka Circuit in Mie Prefecture. This year's event encompasses four days of racing fun, and provides visitors to the area an excellent chance to explore the nearby towns of Nagoya and Ise while getting amped up for the main event! The race is on Sunday, October 7th, which means that the Saturday is open to explore the area. We've created two great ways to spend your day—in the city of Nagoya, where history and modernity blend together, or in Ise, where Japan's ancient traditions are just waiting to be discovered! If you're traveling from Tokyo to watch the Grand Prix, one of the easiest ways to get there is to transfer in Nagoya via the Tokaido-Sanyo Shinkansen. Since you're going there anyway, why not take the opportunity to soak in some of the local sights in one of Japan's most historic castle towns? Her name is Nana-chan, and she stands proudly in Nagoya Station in front of the escalator that leads to the Meitetsu Bus Center. Nana-chan is one of the best places to meet up with friends before exploring the city; after all, a 610-centimeter-tall (about 20 feet) mannequin is hard to miss! She's often decked out in seasonal outfits or branded wear promoting special offers, but no matter what she wears she's definitely something you'll only see in Japan! Built in 1612 by order of Japan's great unifier Tokugawa Ieyasu, Nagoya Castle is a striking pillar of Japanese tradition in a city of modernity. Nagoya Castle's expansive grounds contain a beautiful garden, and the surrounding forestry is especially lovely in autumn. Be sure to note the golden creatures at the top of the castle, the dolphin-like beasts known as shachi. With over 1,200 shops and restaurants, as well as a monthly antique market held on the 18th and 28th, the Osu area is a shopping hotspot buzzing with people. Not only is it the perfect place to shop 'til you drop, but it's also the venue for many awesome events throughout the year, like the Osu Street Performance Festival held in mid October. There's also the Osu Kannon Temple, a Buddhist temple originally constructed in 1333 dedicated to Kannon, the goddess of mercy. Nagoya is a city practically bursting with museums. There's the Aichi Arts Center, the Tokugawa Art Museum, the Nagoya City Science Museum and many, many more! The heart of Nagoya's downtown area, Sakae is the place to visit for high-end shopping and nightlife. It's also chock-full of popular sights, like the Nagoya TV Tower and the Sunshine Sakae Ferris wheel. Located outside of Nagoya in Inuyama, Meiji-mura is an open-air architectural museum that also doubles as a theme park of sorts. There are over 60 buildings (spread out over its one million square meter grounds) that bring Meiji-era architecture to life. With so much to explore, as well as shopping and dining options, it's a place a family could easily spend an entire day. ・Miso Katsu - This crunchy pork cutlet is breaded and fried to perfection, and covered in Nagoya's famous red miso sauce. ・Tebasaki - Nagoya-style chicken wings are grilled, and covered in red miso or salt and pepper. Goes great with a cold Japanese beer! ・Kishimen - A flat noodle served in a savory broth. Tastes great hot or cold. ・Ogura Toast - Nagoya is one of the few places in Japan that focuses on breakfast! This is thickly sliced toast covered in butter and covered in a sweet red bean paste. For those who want to get in touch with Japan's deep traditions, we recommend the Kyoya Ryokan. Just a short distance from Nagoya Station, it's the perfect place to enjoy the tranquility of a traditional Japanese inn even in the heart of a city. If you're looking for luxury, the Nagoya Tokyu Hotel is a great choice. Plus, it's located in Sakae, which means it's super easy to enjoy Nagoya's downtown area! If these lovely accommodations are full, check out other options in Nagoya at Booking.com. About an 80 minutes from Nagoya by Kintetsu-Limited Express, Ise is located on the Shima Peninsula in Mie Prefecture. Home to Ise Jingu and over a hundred smaller jinja (Shinto shrines) scattered throughout the area, Ise is the perfect place for those who want to see a more local, traditional side of the region. Ise Jingu is dedicated to the sun deity Amaterasu-Omikami. In fact, one of the Three Imperial Regalia—the mirror known as Yata no Kagami, symbol of Amaterasu-Omikami—is enshrined in a palace on the grounds that isn't open to the public. The grounds of Ise Jingu are quite large, and are said to cover the same area as Paris, France. The structures are surrounded by dense, peaceful forests, as well as the tranquil Isuzugawa River, which is spanned by the famous Ujibashi Bridge. It's a truly awe-inspiring place that should be at the top of every visitor's travel itinerary. This old-style shopping street was created in 1993 to embody the deep sense of gratitude for the beautiful nature and bountiful resources of the Ise area. With specialty local foods, arts and crafts, restaurants and venues to experience various cultural activities, there's truly something for everyone in Okage Yokocho. Technically, Okage Yokocho is a part of Oharaimachi, but there's so much to do in the area that it's worth mentioning again. On top of the Edo-style buildings and shops, there's also free taiko drum performances on weekends, as well as a museum about the old pilgrimages to Ise. The Ninja Samurai Kingdom - Ise is a bit further afield than other attractions in Ise, but is jam-packed with fun for the whole family. A historical amusement park themed after samurai and the ninja for which Ise is famous, visitors can dress up as ancient warriors and enjoy traditional games, learn the art of the ninja, watch performances, visit a full-size replica of Azuchi Castle and more! There's no place like it in the rest of the country. ・Matsusaka Beef - Matsusaka is a city in Mie Prefecture, and Matsusaka beef is the regional brand of wagyu that is famous throughout the entire country. It's popular to eat over rice as a gyudon, or as delicious, tender steak. ・Akafuku - Akafuku is a sweet type of mochi for which Ise is famous. That same sweet mochi is even more delicious when it's on Japanese shaved ice and covered in matcha syrup! ・Ice Cream - While you can get ice cream anywhere in Japan, Oharaimachi has several unique flavors, including ebi (shrimp)! Located on top of a hill, this hotel offers guests beautiful ocean views, especially at sunrise. There's also indoor and outdoor hot springs, karaoke, massage treatments and more! A gorgeous seaside accommodation located in Ise-Shima National Park, the Shima Kanko Hotel was renovated in 2016 to serve as a venue for the G7 Ise-Shima Summit. The hotel features all the luxuries and amenities you'd expect (as well as some you might not, like an on-site fitness center), and features a gorgeous Japanese garden on its premises. If either of these fantastic locations are unavailable, check out the other accommodation options at Booking.com. When you're ready for Formula 1 action, that means it's time to head over to the Suzuka Circuit! Located in the nearby town of Suzuka, getting there from Nagoya or Ise is easy. From Nagoya Station or Iseshi Station, simply take the Kintetsu-Limited Express. Get off at Shiroko Station, and transfer to the #03 bus toward Suzuka Circuit. As well as the race, the Grand Prix will feature exhibitions of legendary F1 cars, special guests, a drivers talk show and more! And once you get shoulder to shoulder with other fans, you're sure to get fired up! The Suzuka Circuit also features a full-fledged amusement park for those looking for a little more family fun. Most of the attractions are related to racing, such as the go-kart racing area GP Field, the larger vehicles fit for children in Putti Town or the Moto Field, which has two-wheeled bikes, and a Ferris wheel. There's also an Aqua Adventure open during summer, a camping ground, numerous dining options and more. There are also nearby hotels and Japanese-style inns where you can enjoy a nice soak in a hot spring. 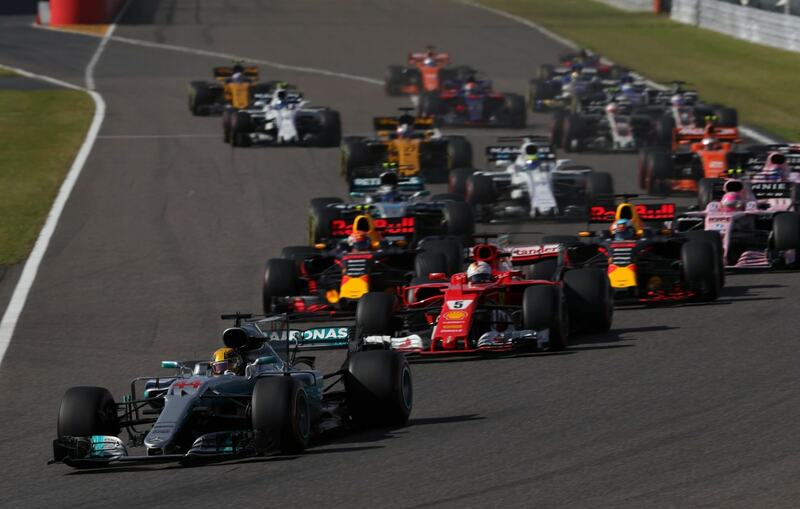 We've got Formula 1 fever, so stay tuned for more coverage of the 2018 Japanese Grand Prix! In the meantime, check out the the following links for the full itinerary and the latest Formula 1 information.